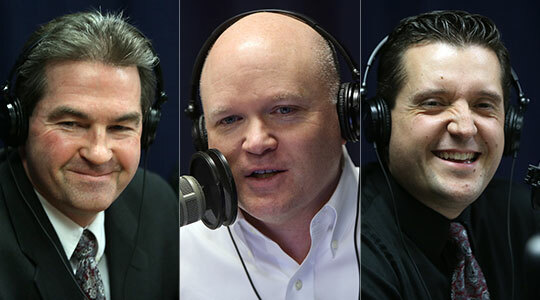 Summary of today’s show: Catholic Schools Week begins today with Jorge Hernandez and Jim Walsh of the Catholic Schools Office sitting down with Scot Landry to talk about the state of Catholic education in the Archdiocese of Boston, the principles of excellence that encourage in schools, as well as some of the amazing success stories among local Catholic schools that have seen growth in enrollment and academic achievement. 1st segment: Scot welcomed everyone to the show. He said it’s Catholic Schools Week and he said the theme this year is “Catholic schools raise the standards.” He said across the Archdiocese of Boston, everyone in Catholic schools have been working hard to raise the standards of Catholic education. Today, we’ll look at Catholic education in Boston at a macro level and the rest of the week in specific schools. He welcomed Jorge Hernandez and Jim Walsh, area superintendents for the Catholic Schools in the Archdiocese. Jim said Catholic schools educate 2 million students across the US, 1.4 million in elementary schools. In the archdiocese, 41,000 in 121 Catholic schools, both run by parishes and independent and run by religious orders. Scot said 41,000 is at least as big as any public school district in the state. Jorge said in terms of the number of schools it is certainly one of the largest. Scot said Jorge is responsible for the North and Merrimac regions. He asked him what made him leave Merrimack College to come work as an area superintendent for the Archdiocese. He said it’s a wonderful team in the Catholic Schools Office. He’s been able to see another aspect of Catholic school education, having gone to Catholic schools from K through college, on both the West Coast and East Coast. His parents were Mexican immigrants to the US and they treasured Catholic education. He said Catholic schools are unique. They offer an opportunity to be engaged in faith and to be top academic leaders. Scot said Jim has worked for the Archdiocese of many years. Jim said he grew up at St. Gregory’s in Dorchester and his family had faith as a very important. He attended Catholic high school and college and his kids have gone to Catholic schools. He said Catholic schools educate the whole person, including faith in terms of who we are. Bringing faith to the heart of every child is a gift of life. Teachers are partners with parents in forming the children. Scot said Catholic education forms the heart and teaches them how to love. He said education and classroom work alone isn’t enough to form a good person. Jim said St. Catherine’s in Norwood has a simple motto of “See Christ in others. Be Christ to others.” The school uses that every day in morning prayer with the children. It helps the children to understand we are individually called to serve Christ and His Church. Jorge said Catholic Schools Week calls attention to all the different ways that Catholic schools benefit the students and community. Activities are individual to the school, such as Masses or open houses or alumni reunions. Jim said a lot of students from referrals from family, neighbors, and others who are in Catholic schools. Having a parish Mass dedicated to the school and then an open house allows them to show what the school stands for, the commitment to values, the teachers’ values. Jim said the Archdiocese formed a partnership with Boston College a few years ago to run St. Columbkille School, which has almost 400 students now. At a recent gathering, BC president Fr. Leahy talked about how the school has nurtured the faith of students over the years. Scot asked why St. Columbkille has grown so much in recent years. Jim said they were able to bring a bunch of resources, not just financial, but also pastorally, infrastructure, administration and in other ways. They’ve brought reassurance to the neighborhood that the school will be stable, after Presentation School closed nearby, so that people feel confident sending their children there. Stable enrollment allows the school to invest in curriculum, teacher ongoing formation, etc. Scot said when enrollment declines, it’s tougher for a school to invest in growth. But turning the tide also creates an upward spiral too, as people have confidence in a consistent level of instruction. Jorge said Notre Dame Cristo Rey in Lawrence is another wonderful school. It has a model of education where students also work part-time in jobs at local businesses that provide both work experience and an income that defrays tuition costs, in addition to the rigorous academics. They have almost 300 students, growing from 100 students in the past five years. Another great story is the formation of Lawrence Catholic Academy, which serves 500 students from pre-K to eighth grade. He said there are tremendous high schools throughout the archdiocese. Scot noted that the Xaverians Brothers have helped revitalize Lowell Catholic High School in recent years. Jim said it’s another unique partnership opportunity with the Xavierian Brothers and in 3 years have brought enrollment nearly to capacity. 2nd segment: Scot read from essays by Catholic school students submitted to an essay contest in the Diocese of Fall River’s The Anchor newspaper on what they love about Catholic school. Managerial excellence including strong financial management. The Schools Office offers workshops for principals, teachers, staff, and pastors on leadership and governance, fiscal sustainability, the need for boards, the role of the administration as a hub for information. As they work on challenging decisions, they realize the importance of involving laity in terms of boards. This puts a strain on the administration in terms of providing information. The goal is to start looking into the future for planning. Jorge said behind every successful Catholic schools is a successful Catholic school leader in spiritual, academic, and managerial leadership, whether pastor or principal. They discussed how tuitions have risen to provide greater resources for the higher excellence. Jorge said this is why the support of the community is so vital. The reasons for the decline are familiar: the steady drop in vocations to the religious teaching orders who were the greatest single work force in the church’s modern period; the drastic shift in demographics of the late-20th century that saw a dramatic drop-off in Catholic immigration from Europe; the rising cost of living since the late 1970s that forced nearly every American parent to become a wage-earner and put Catholic education beyond their budget; and the crumbling of an intact neighborhood-based Catholic culture that depended upon the parochial school as its foundation. The most crippling reason, however, may rest in an enormous shift in the thinking of many American Catholics, namely, that the responsibility for Catholic schools belongs only to the parents of the students who attend them, not to the entire church. Nowadays, Catholics often see a Catholic education as a consumer product, reserved to those who can afford it. The result is predictable: Catholics as a whole in the United States have for some time disowned their school system, excusing themselves as individuals, parishes or dioceses from any further involvement with a Catholic school simply because their own children are not enrolled there, or their parish does not have its own school. Scot said he used to think like that. He thought back to a previous era, when every Catholic sent their children to a Catholic school because the Church was persecuted. But later, at least in places where there were more Catholics, even in public schools there were so many Catholics that it was almost like a Catholic school. That has changed. Jim noted that up to the early 70s most schools were supported by parish offertory where they didn’t charge tuition. He said the Archdiocese needs to to take action so that the whole approach of evangelization to make Catholic schools an integral part of strengthening parish collaboratives. Scot said there could come a day in Massachusetts when the way to stand up to support Catholic schools will be to call legislators in support of legislation that would allow a tax break or school choice for parents who want Catholic education. Scot said he often hears from Catholic school alumni about their gratitude for their teachers. He said teachers today are very dedicated, especially when public school teachers have much better pay and benefits. Catholic school teachers have made a commitment to the Catholic school setting. Jorge said he points to the various religious orders who were responsible for his Catholic education. He thinks many Catholic school teachers in the archdiocese were themselves similarly inspired and touched by their own Catholic school teachers, especially in the religious orders that laid the foundation for Catholic education in Boston. They are often very passionate about the mission of the Catholic school, integrating faith, life, academics, social justice. They work everyday in the common mission of the betterment of society and that’s why the Catholic educators don’t see it as a job, but as a vocation. Jim said last year, there were 16 new principals or school presidents and about 40% came from public education. He said the CSO has also encouraged among educators some professional development so they can themselves step into those roles some day. He said there are two kinds of governance. The legally independent schools have independent boards, and parish schools have advisory boards. They are always looking for people with backgrounds in various disciples like human resources, finance, technology, marketing, facilities, and more. Everyone can be a part of the education. Jorge noted that there’s been an increase in enrollment in early education programs for ages 3 and 4. He said families want more than just day care, but to ensure that they’re receiving instruction in a values-based educational environment.